AiP is actively seeking sponsors. Join us in saving this valuable Victorian glasshouse. NEWBOLT TRUST: Newbold Trust advocates for a positive way of living described as a ‘Life Sustaining Society’ where we can thrive personally, co-exist in harmony, feel interconnected with the living system of the planet and therefore protect and conserve this for future generations. Registration for 1 week covers Sunday afternoon through Saturday morning. Scholarships and student rates available. Date: Project postponed. New 2020 dates coming soon! 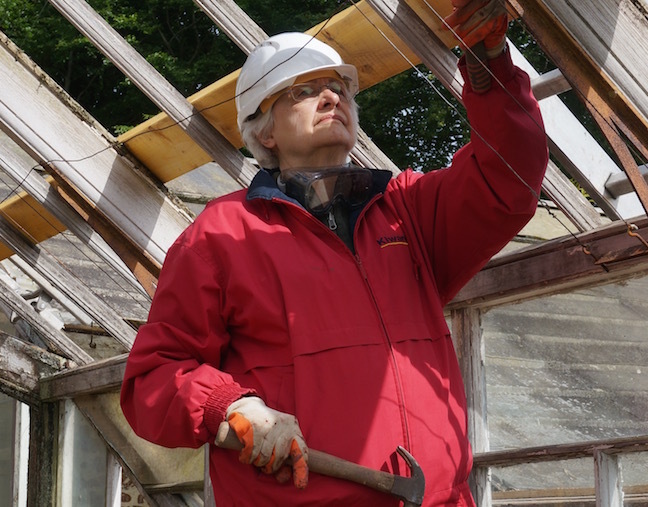 Learn timber conservation and glazing skills as you help Newbold Trust save their rare Victorian glasshouse. A rare glass conservatory in beautiful northern Scotland needs your help! The Newbold Trust and Adventures in Preservation have formed a partnership to take on conservation of this Victorian ornamental glass “hothouse” built by the renowned MacKenzie & Moncur. The glasshouse is attached to the elegantly styled Newbold House constructed in the 1890s. During this historic preservation experience, AiP team members will build on the skills we learned while repairing and re-glazing the nearby Burgie glasshouse, where conservation work began in 2017. Newbold House originally had a staff of eight full-time gardeners caring for plants in several greenhouses and outdoor gardens. The gardening tradition continues today with vegetarian dishes prepared from Newbold’s homegrown vegetables and fruits. The house became a hotel in 1959, and by 1979 was used to host workshops. It was purchased by a small group of like-minded people, who created the Newbold Trust in 1982, operating the site as a workshop centre that now draws people from around the world. Mackenzie and Moncur led the field in hothouse design and construction in the late Victorian era. The company was responsible for construction of the famous Liverpool Palm House. Their Victorian conservatories are becoming increasingly rare, giving urgency to this project. The Newbold conservatory is currently in a state of significant disrepair. A number of original features will imminently be lost to rust and rot. The Trust anticipates that if conservation work does not take place within the next 18-24 months, the conservatory will have to be closed due to Health and Safety considerations. Without the benefit of this beautiful space, Newbold’s function as a vibrant community hub will be sorely diminished. This project aims to restore the structure as closely as possible to its original state and to retain as much of the original fabric as possible. Every part of the conservatory needs attention, although happily the main supporting metal columns appear to be in sound condition. Newbold Trust provides a great service to the international community. The Trust is a transformative social enterprise run by a small residential team dedicated to teaching skills for sustainable living and nurturing positive change. They offer workshops and retreats on topics from creative writing to sound healing to yoga and more. They also use the conservatory for local community events such as garden days and the autumn food festival. The ornamental hothouse greatly enhances the experience of all who attend Newbold events. The economy in northern Scotland has faced setbacks as the fishing industry and other traditional trades have declined. The program at the Newbold Trust contributes to rebuilding the regional economy. Work begins at 9am, after a leisurely breakfast, with a discussion of the day’s tasks and demonstration of skills as needed. Tasks vary depending on which session(s) you attend, and you’ll have the opportunity to learn skills involved in several tasks. There is an hour lunch break; work ends about 5pm. A detailed schedule is provided after registration. Meeting new friends, spending time in the glorious Highlands, being able to work in such an interesting historic place. The entire project was extremely rewarding! Each week, we will take a one-day tour of the region. Exact itineraries are yet to be finalized, but will include castles, distilleries, beautiful coastal and highland scenery and more. We will also take a late afternoon tour of the ruins of Kinloss Abbey, founded in 1150 by King David I. This will be followed by a walk through the old village lanes of Findhorn and dinner at the Kimberley Inn. Given all there is to see and do, you might consider extending your visit to Scotland, before or after your project session, to take advantage of Scotland’s many historic and natural sites. Lodging is provided in the Victorian-era Newbold House. Double, single and family rooms are available. Be aware that rooms are not en suite. There are four showers, three toilets and one bath on the same floor as the bedrooms. The Trust states that this arrangement has worked well during all their workshops, even with a full house. Newbold provides delicious vegetarian meals, largely from foods grown onsite in their seven acres of gardens or grown locally, prepared in their own kitchen. Meals include dairy and eggs, but no fish or meat. For those wanting a change from vegetarian fare during our stay at Newbold, we will go out to local restaurants for several lunches or dinners. There is always a tasty selection of crackers and oatcakes with peanut butter, jams and more available for snacks. Free wifi is available. Laundry with drying rooms is available for a small fee. It was a beautiful experience I will never forget. Sharing the space with the host family and working with the local builders allowed me to know the best side of Kosovo and its culture. Your project fee of USD1390 per week covers the cost of lodging in a double room, most meals, training, transportation to and from Inverness Airport and excursions. If you prefer a single room, an additional single supplement of USD240 will be added to your fee. Residents of Scotland – who live near Newbold, don’t need lodging or pickup, and don’t plan to join excursions – are welcome to attend at no cost. You may either bring your own packed lunch or a hot lunch is available for £11. If you need lodging and meals, the cost is £275 for five days. Contact AiP if you are a resident of Scotland and would like to attend. If flying, the Inverness Airport is closest to Newbold, and airport pickup will be arranged. If arriving by train, you will be picked up at the train station in either Inverness or Forres. If you plan to rent a car, the drive from the Inverness Airport is about 25 minutes (26 miles); from Aberdeen International Airport is a little over 2 hours (75 miles); and from Edinburgh is about 3.5 hours (170 miles). High temperatures in late April and early May average around 55 F/ 13 C, and lows average around 40F / 4 C. Bring clothing that is appropriate for the temperatures and also protective while working. Rain is always possible, so bring adequate rain gear, along with sturdy shoes.